Metro Nashville Chorus earned a 9th place medal in the Sweet Adelines International Chorus Finals on 11/20/18. 34 choruses from around the world qualified to compete at the International level this year. On Thursday 11/18, each chorus performed two songs and was judged. The top ten scoring choruses proceeded to the Finals. After the semi-final round, Sweet Adelines presents the Harmony Achievement Award to the highest score chorus below a specific number of voices. 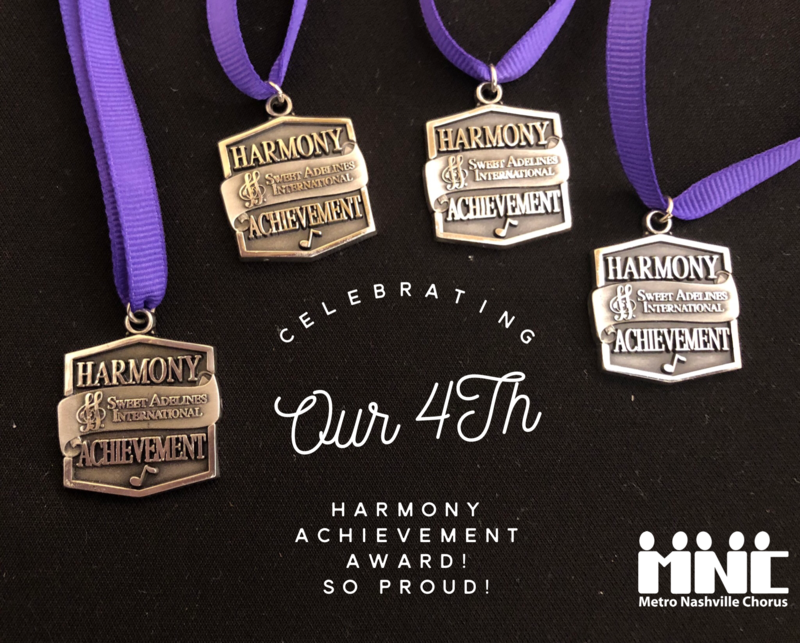 This year that limit was 55, and MNC (with 44 singers on stage) earned the Harmony Achievement Award this year for the fourth time. On Saturday 11/20, the ten choruses presented a fifteen-minute performance package. Metro Nashville's package was an adaptation of the Princess and the Pea fairy tale, including two songs from "Once Upon a Mattress." At the end of the contest, MNC was named 9th in a field of the best barbership choruses in the world: Scottsdale (1st), and Harborlites (2nd) and Rich-Tones (3rd). MNC was proud to share the International stage with more than 2000 Sweet Adelines International members during the week. It was a wonderful convention and contest!